The British journalists were in Qatar, "invited by the prime minister's office," according to BBC correspondent Mark Lobel. The government had organized a press tour for a number of journalists, following an ongoing international outcry at Qatar allegedly infringing migrant workers' rights. The people constructing infrastructure for the football World Cup are believed to be facing poor labor conditions in the oil-rich Gulf state. The BBC crew was about to film a group of workers from Nepal while gathering "additional material for our report" in the capital city of Doha, Lobel wrote in his piece for the BBC on Monday. This is when, according to the journalist, they were "dramatically" arrested by police. "A dozen security officers frisked us in the street, shouting at us when we tried to talk. They took away our equipment and hard drives and drove us to their headquarters," Lobel wrote. The correspondent, along with the cameraman, translator and driver were taken to a police station, where they were "interrogated separately by intelligence officers." After "hostile" questioning the crew was taken to a local prison. Lobel said he found out he had been trailed in Qatar since his arrival there. According to the journalist, he was told that "the detention was being dealt with as a matter of national security." The crew was jailed for two days before being released with no charges brought. 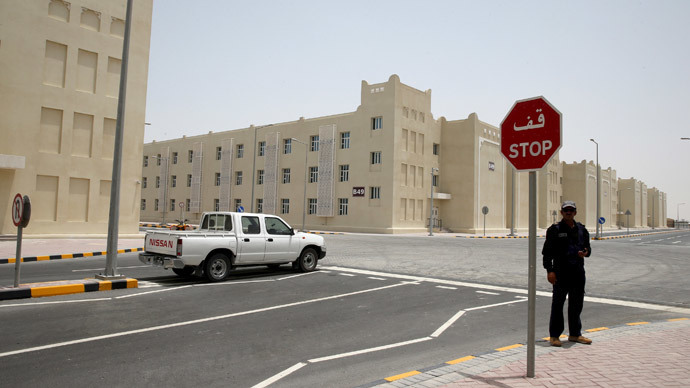 In a statement, released on Monday, the Qatari government said that while the state communications office invited a dozen reporters to see the labor accommodation and interview "whomever they chose," the BBC crew decided to film out of the itinerary. "In doing so, they trespassed on private property, which is against the law in Qatar just as it is in most countries," the statement says. The BBC says the authorities are trying to "justify the detention," and that the journalists reject what the officials say. According to the media company, the crew's equipment was confiscated and never returned. FIFA is now investigating the incident, having released a statement saying that "any instance relating to an apparent restriction of press freedom is of concern." The recent arrest is not the first case of Qatar's alleged attempts at preventing journalistic investigations in the country ahead of the 2022 World Cup. This month, journalists from Germany’s biggest television networks were reportedly detained, questioned and not allowed to leave Qatar for some days.